In April 1970, China's first satellite was successfully launched into the pre-defined orbit. Since then China has developed more communications satellites. Up to now, Dongfanghong series of geo-synchronous orbit communications satellites has been successfully developed, namely DFH-2, DFH-2A, DFH-3 and DFH-4. DFH-2 and DFH-2A are spin-stabilized satellites, and DFH-3 and DFH-4 are 3-axis stabilized satellites. DFH-4 is the third generation communications satellite bus in China with high power, strong payload capacity and extended service life. It consists of propulsion module, service modules and solar arrays. DFH-4 bus is applicable to high capacity communications satellite, direct broadcasting satellite and regional mobile communications satellite, etc. As of December 31, 2013, CGWIC has successfully delivered five communications satellites in orbit to its international customers respectively, namely NigcomSat-1, VeneSat-1, PakSat-1R and NigcomSat-1R and TKSAT-1. 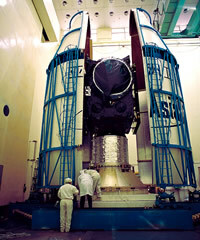 Currently, other four DFH-4 satellites are under construction for international customers.